Our Home Heat Loss Calculator gets used several hundred times a day, so I thought it would be good to make a few small updates. The calculator lets you estimate the heat loss, yearly energy use, fuel cost, and greenhouse gas emissions that result from heating your house. 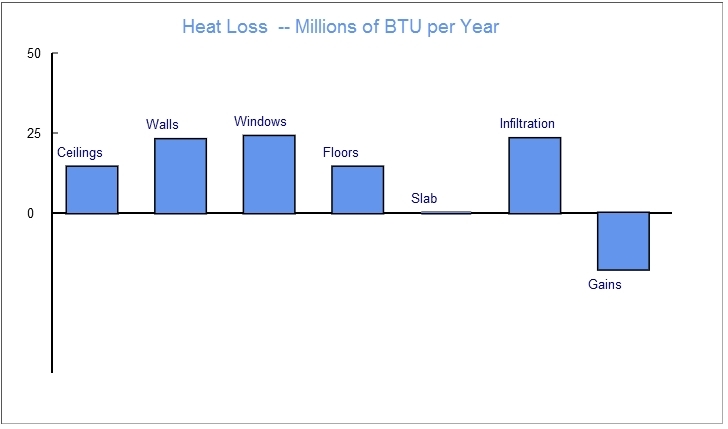 It estimates losses for ceilings, walls, windows, and floors and losses due to air infiltration. Its easy to use, and some examples are provided to get you started. Probably its biggest value is giving you some idea where the major heat losses are in your home, which is the first step in identifying which areas will give the most bang-for-the-buck for improvements. It also lets you try various improvements and see the resulting saving in dollars and CO2. If you use the calculator now, be reassured that no algorithms have been harmed in this update — it gives the same answers it always has. The one small number change is that CO2 emissions for electric fuel were lowered from 2.2 lbs/KWH (typical of coal generators) to 1.5 lbs (average US generation). 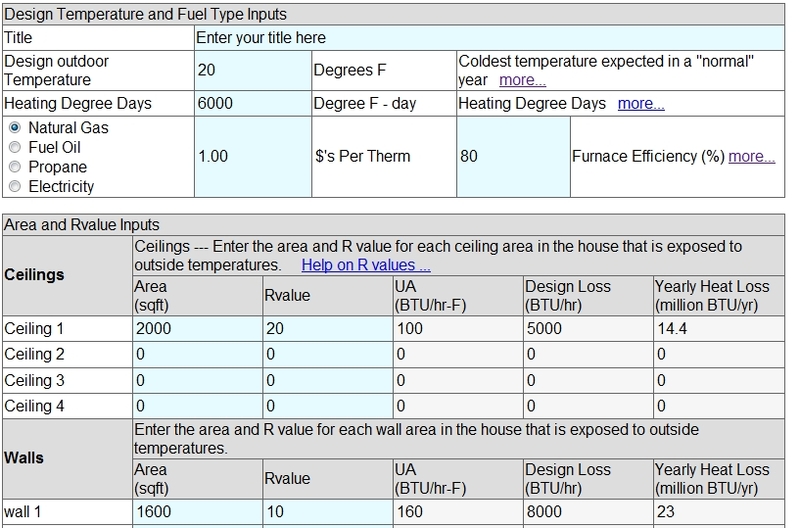 The inputs look like this — basically define your climate, pick a heating fuel, and enter Rvalue and area for ceilings, walls, … Mercifully, there is only one page of inputs to fill in. You just enter your numbers in the blue boxes. The summary output looks like this — yearly energy, cost, and CO2 for your house as well as coldest temperature hourly loss rate. If you have any thoughts on improvements, let me know.